The first crews to clean up Chernobyl were called 'liquidators' and they received many, many benefits for their incomprehensibly dangerous work. Here is a very cruel, very Soviet description of one of those benefits explained by a liquidator at the site in 1986. This story comes from A.V. Strannik's LiveJournal page, translated right here on EnglishRussia. Strannik works as a psychic (here he is on TV) and his LiveJournal page is filled with the kind of posts you might expect on a Ukrainian psychic's LiveJournal page. Aleksandr Vladimirovich is not what you would immediately call a reliable source. 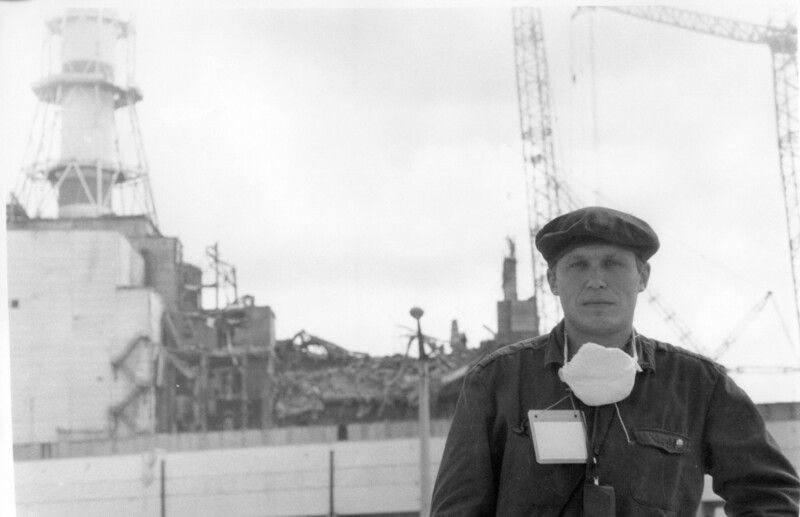 But here he is being interviewed by The Chernobyl Project about working at Chernobyl just months after the meltdown, here he is pictured standing in front of the reactor wreckage, and here he has posted posted his recollections of his time working there more than once. With this in mind, here is A.V. 's description of the Chernobyl cleanup from a worker's perspective in mid-August. In the aforementioned interview, A.V. states he was at Chernobyl for one month, working mostly with washing vehicles (absolutely everything got washed daily) and coordinating others in what he describes as the largely uncoordinated cleanup effort ultimately involving hundreds of thousands of people. Dozens died within months as Nautilus describes, and the prospects for the others was far from rosy. In his own posts on LiveJournal, A.V. gives more personal recollections, along with scans of his photos from his work there. He talks about collecting bags and bags of huge mushrooms sprouting up near the reactor and the smell of them frying wafting through the dorms. He talks about the moment when he and another guard ran out after feeling the rumbling of another explosion, only to discover it was only a small earthquake nearby. He talks of some kind of helicopter crash after a photographer asks to get pictures above the reactor, though Google Translate muddies up the details. Alcohol, A.V. goes on, was banned after too many concrete trucks ended up overturned. There are some details on how workers would be shifted from 'hot' crews working right at the melted down reactor, and when they had received their measured limit of radiation, they'd be moved to a further-away 'cold' crew. Whether some workers reached their radiation limit over the course of an hour or over the course of a single day isn't perfectly clear. A.V. goes on to give what Google Translate renders into a very disjointed explanation of the radiation at the site. And why he thinks so much of the effort to clean the site was either unnecessary or futile or somehow a waste itself. It's easy to go down a long, dark rabbit hole of the Chernobyl cleanup (this explanation of the Elephant's Foot is probably the best/worst place to start), but there's one description from A.V. that stuck out to me that I'd never seen elsewhere. It was about the pay. A.V. admits that people like him got five times the ordinary wages for their work, and many sources talk about how liquidators got other honor-oriented benefits like special medals from the State. Here's what I'd never heard anywhere else — A.V. recounts that liquidators were allowed to get a Lada without waiting in a queue. It's famous how people living in the Soviet East put their names down to buy a car and it's famous how they waited for years to make the purchase. To not have to get in line for a car would've been a huge deal. A.V. has an almost poetic review of what that offer to the liquidators really meant. Вот парадокс времен СССР, - «Жигули» - ценой жизни. Here is the paradox of the Soviet times – "Lada" is the cost of life. The price of a Lada was your life. If that's not a cruel glimpse into the Soviet Era, I don't know what is. You can find all of Aleksandr Vladimirovich Strannik's pictures on his LiveJournal right here. Photo Credits: Associated Press/STR. The picture of people watching from the helicopter was taken by Igor Kostin, and the picture of workers with banner reading "We will fulfill the government's order!" was taken by Volodymyr Repik.